Warning: This story is dark and full of spoilers for Game of Thrones season eight, episode one. Among the many gasp-worthy moments on last night’s Game of Thrones season premiere, one stood out: young Lord Umber pinned to the wall, surrounded by an eerie spiral of dismembered arms and legs. As Beric Dondarrion (Richard Dormer) points out, this is surely the work of the Night King: but what exactly this symbol means, and where it comes from, have yet to be revealed. First and foremost, this gory display is a message about the undead army’s progress. The scene takes place at Last Hearth, whose early fall Insider reminds us was predicted by Jon Snow in season 7. “If they breach the Wall,” Snow told the northern lords, “the first two castles in their path are Last Hearth and Karhold.” So, the Night King seems to be following Snow’s predicted path — and is steadily making progress south toward Winterfell. The display is also a trap: Lord Umber quickly reveals himself as a White Walker, and the soldiers are forced to light the whole display on fire to hold him back. Once the swirling limbs catch flame, the visual isn’t just haunting: it’s hauntingly familiar. First, we’ve specifically seen the White Walkers arrange corpses this way before. As Imgur user glabeglabes helpfully juxtaposes, we see similar swirling displays in both the GoT pilot and season 3, episode 3. So, perhaps it’s simply part of the White Walkers’ unique killing style, and a way of striking fear into the hearts of their enemies. However, that seems too simple for many GoT fans, who note that the flaming spiral also bears striking resemblance to the Targaryen sigil. As shown by Reddit user illuminadii, the rounded three-headed dragon representing the Targaryens takes an eerily similar shape — which could point to a connection between the Night King and the Targaryens (possibly even Daenerys herself) down the line. As reported by Polygon, Jon Snow finds similar symbols carved into the walls of the dragonglass caves at Dragonstone. Given that Dragonstone is both Daenerys’ birthplace and the ancestral seat of House Targaryen, this seems to reinforce the idea that the Targaryens and the White Walkers have a history — to say the least. Finally, the spiral image has a strong connection to the Children of the Forest, who originally created White Walkers to protect themselves from humans — then had to band with humans to destroy the monsters they’d created. When Jon Snow finds the spiral carvings, he says they were carved by the Children of the Forest “in memory of the battle they fought,” perhaps suggesting that White Walkers were creating similar corpse-spirals during that battle too. But Polygon also notes the spiral’s appearance in Bran’s season 6 vision of the White Walkers’ original creation. There, as the Children of the Forest prepare to create the first White Walker, we see the same spiral pattern formed from above. So, what does that mean? Honestly, fans are still stumped at the moment. It seems clear that the spiral pattern is integral to the White Walkers’ existence, and we should take any further spiral-symbol appearances as a sign of their approach. We should also be on high alert for other characters — especially those with Targaryen roots — displaying the spiral themselves, since it could be a hint toward an unrevealed connection with the Night King. Finally, given that Bran’s role this season seems to be moodily lurking and giving cryptic advice, we should be on the lookout for any reactions he has to seeing this spiral pop up. 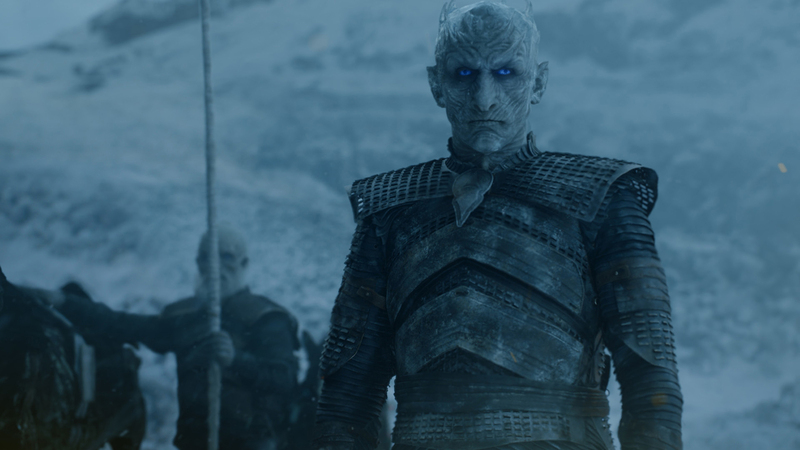 Whether or not Bran is actually the Night King, we’re willing to bet he knows more about the Night King’s plan, and mode of operating, than anyone else in Westeros.